And if you think that’s crowded, you should have seen the one before it. Admittedly this was down to earlier cancellations, but regular peak hour travellers know this kind of thing isn’t that unusual. But hey, they are blowing a billion dollars widening the Westgate and Monash freeways by a lane each. Idiots. PS. Train home just as crowded. PPS. Thursday 6pm. Connex will offer compensation for January’s poor performance. V/Line are offering compensation for December. Details here. ← Previous Previous post: Are actors rich? Anyway – here goes. I will be in Melb for a year or more and need to travel mainly around the city but maybe once a month or every three weeks I will need to get to Sunbury. Yeah…going home last Friday….how many trains in a row cancelled on the Belgrave (I mean Box Hill) and the Glen Waverly lines? Here we are on a “Summer Timetable” and they still manage to not run the whole service without cancellations. Saw your name in ‘the age’ today Daniel. I was so excited except I was at work and I didn’t think anyone else would be too thrilled to hear ‘a guy whose blog I read’s name is in the paper’. Gia: If you’re travelling each day of the working week, buy yourself a Zone 1 yearly ticket. Purchase a Daily zone 2 ticket for the occasions when you’re travelling to Sunbury. Almost every night last week it took me two hours to get home. This is shocking service. Seriously. Cancelled trains and late trains every now and then is one thing but every single day is ridiculous. I hope Connex gets HUGE fines and I hope that one day in my lifetime, the transport system will be back in the government’s hands. Gia, Anon is right (in case it’s not obvious, Sunbury is accessible by train). Aren’t they a happy looking bunch of fellow travellers. They look like they could murder Batch… no Kosk… no Brac…no Kenne… no, a private foreign company running trains to make a profit, not as a service. That is a shocking thing to read about. Excuses, excuses up the kazoo, too, I’m sure. Well, sadly, only floods of complaints to every level of government will likely “do” anything to fix it. I mean, if you all write an actual letter to say “THIS STINKS, literally, and figuratively” then perhaps, something will get done. Sad state of affairs to read about. My sympathies. How many of these people realised you were taking their picture and how many will sue?? I saw a semi trailer on the Hume Hwy and the trailer body was an old Hitachi carriage. Had normal truck wheels under it. Looked pretty funny. And long, too. Anon: [WARNING: EXCESSIVE DETAIL OF RAILWAY TIMETABLE] Judging from the SMSs and the summer timetable (and using times at Cheltenham for consistency) it was the 7:31, 7:43 and 7:59 were all AWOL on Wednesday morning. The latter two don’t stop at Ormond, but when you’re trying to pack peak loads into half the number of trains expected for that period, it’s not surprising the trains that actually ran were so packed. The Hitachi you saw would have been the short run from Cheltenham, getting back to Ormond at 8:33. That one’s usually got space on it (though not as much as years ago when I could regularly get a seat on it at Glenhuntly). Janice, lots of people work flexible hours (indeed I tend to start around 9:45 most days), but many head in in peak hour. Not that people’s working patterns is to blame in this case – it’s mismanagement of the railways that resulted in the situation shown. People are using public transport due to the petrol price rising. 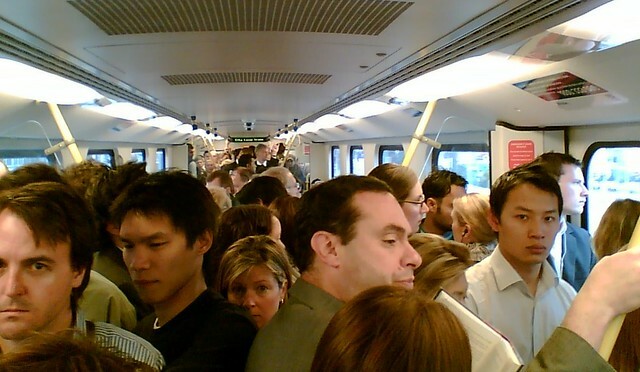 Melbourne trains are getting more and more crowded. I remember regularly catching a train with Daniel when we were going to high school. He’d get on a couple of stops before me and we’d always go to South Yarra. In those days it seemed like the service was reasonable – I do not recall any major regular problems. Seems like privatisation was done in this case quite badly. this is one of the reasons when i move to melbourne in 2 months i’ll be living in the city if at all possible. after living in sydney i’m sick of public transport making my work day longer than it needs to be! When I look at pictures like that I remind myself why I live in the outback. I’d be clawing, sweating, turning blue till someone shoved me out!! No personal space! Now I know why some people in the express line at Coles stand so close to me that I can feel their breath on the back of my neck eewww!